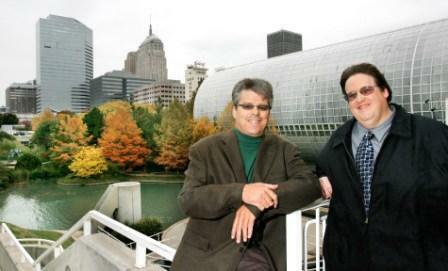 Jack Money and Steve Lackmeyer are award-winning book authors and journalists at The Oklahoman who covered the revival of downtown Oklahoma City starting with the passage of the city's Metropolitan Area Projects, the 1995 bombing of the Alfred P. Murrah Building, and the reopening of the Skirvin Hilton Hotel. As a youngster, Jack participated in musical competitions inside the hotel's second-floor ballrooms and played on the hotel's old elevators, irritating the hotel's staff whenever he would pull the panic button and then run from the car downstairs into the lobby. Jack was a reporter at The Oklahoman from 1989 through 2009. Jack led coverage on downtown recovery efforts following the 1995 bombing of the Alfred P. Murrah Federal Building. He and Steve later became an award-winning team covering the MAPS program and the subsequent redevelopment of downtown. Steve started his career at The Oklahoman in 1990. Since then, he has won numerous awards for his coverage, which included the 1995 bombing of the Alfred P. Murrah Federal Building, the city’s Metropolitan Area Projects, the rebuilding of north downtown, the rebirth of the Skirvin Hotel, the rise of Bricktown, MidTown and Automobile Alley, and the city’s courting of the NBA. Steve’s family came to town in 1977 when his father led construction of the Sheraton Century Center Hotel. He roamed the brand new corridors of the Conncourse tunnels (now The Underground). He saw the final last gasp of the old downtown and witnessed the destruction of the 26-story Biltmore Hotel. He spent his teenage years watching construction of the Myriad Gardens and a new skyline including Mid-America (home to Devon), Oklahoma and Corporate Towers, and Leadership Square. Together, the two wrote "OKC Second Time Around," which entered a second printing in 2007 just months after its initial release. The book was honored for best design in the 2007 Oklahoma Book Awards and the authors' work was recognized with the B.H. Prasad Award by the Central Oklahoma Chapter of the American Institute of Architects. Steve's book, "Bricktown," was released in January, 2009 by Arcadia Publishing. Steve and Jack also authored "Skirvin," a history of the Skirvin Hilton Hotel, which was published in November, 2009, and "Operation Scissortail," an inside look at the construction of Devon Energy Center and the Project 180 makeover of downtown Oklahoma City, which was published in October, 2012. Their next book, a history on the YMCA of Central Oklahoma organization, is due for release in 2014. Jack earned a journalism degree from the University of Central Oklahoma, while Steve earned a journalism degree from Oklahoma Christian University. Jack is the media resources manager at New Dominion, LLC, following a 20-year career as a writer and editor at The Oklahoman. Steve covers downtown development and authors a weekly column, OKC Central for the paper's business section..